Following his performance in Atlanta, Ga. on July 14, 21-year-old drum major for Pioneer, Alex Wilga, talked with DCI.org's Christina Mavroudis about his last year with the corps, and the impression he hopes to leave with them. CM: Tell me about Pioneer's show this year. AW: Our show is called "Fields of Green" and the staff took the word 'fields' and transposed it to mean different fields or genres of music. During the drum solo, there's an Afro-Cuban beat called "Rakes of Mallow" where we play djembes and maracas, and when that ends we go right into a waltz feel. Our show has a lot of musical diversity. CM: Tell me about your musical background. AW: I'm currently going to school at the University of Missouri in Columbia, and I'm a Music Education major. I've marched as a member of the Pioneer for five years, and before that I played lead soprano with the Colt Cadets. I was 15 when I first started in drum corps, and it's been a lot of fun. CM: Do you have any particularly special moments as Pioneer's drum major? AW: I really enjoy spending time with everybody outside of rehearsal. But at the same time I love being a role model and leader to so many people in the corps that have the same love of music that I do. CM: What have you enjoyed most about being with Pioneer? 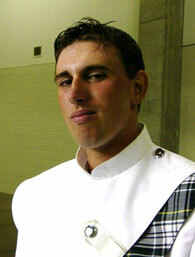 AW: The coolest thing for me is that this drum corps is going in the right direction right now. It's been great to see the corps' growth, and it's been exciting for me pass over the torch to certain members of the drum corps on their way to leadership positions. CM: Is there anything specific that you want to pass on to the rookie members? AW: I really hope they can receive this strong love of the activity that I have. It's always sad for me to see people who march one year and never march again if they have the option. Even if people don't come back to Pioneer, I hope they would choose to march somewhere. CM: What are your thoughts on "aging-out" this year? AW: I've always tried to hold everything back and not be emotional about stuff like that, but the closer we get to Pasadena, and less shows we have left, the more choked up I get. It's going to be tough, but I'm looking forward to it. CM: What's in your future after drum corps? AW: Once I graduate from college, I'll hopefully become a band director. I really want to pass on this love of music I have, and maybe inspire my students to march in a drum corps.